Flight Simulator gives you a wide choice of aircraft. Which should you choose at the beginning? And why it’s not a good idea to start with a 747. Ok – there is nothing wrong with taking a 747 or 777 from London to New York for your first flight. Let me just try to convince you that it is not the best option and that you will be better off fling a different plane and a different route. If you have a “clean” Flight Simulator X or Prepar3d – you can select one of the default aircraft. In such case I suggest Cessna 172. It’s a simple plane which does not require (almost) any knowledge of aircraft systems. It also flies (and lands) with low speed giving you time to think about all the necessary actions. In the first few flights you should familiarize yourself with the plane – with it’s cockpit and with how it taxies, takes-off, turns and lands. It may be less impressive than flying from Heathrow to JFK but it will give you a basic knowledge about flying. After some time – when you finally switch to 747s – you will be able to fly it – instead of only relying on the autopilot. For those who can afford a payware add-on – I have a some suggestions, but let me first say what you should consider. 1. Has tricycle undercarriage (has a single front wheel). Planes built that way are easier on the ground (also in take-offs and landings). 2. Has piston engine with fixed pitch propeller. Keep things simple – take a plane which power is set by the throttle alone. You will learn to manage the variable pitch propeller (a.k.a. constant speed propeller) later. Stay clear from turboprops – you will need your engine to react without any delays to the power changes you make. 3. Flies and lands with low speed. You will need all the time the plane gives you to check (and manage) your heading, altitude and attitude. 4. Is light. C-130 with no payload and with (almost) empty tanks can fly as slow as some Cessnas. That does not change the fact that it is a heavy plane with lots of inertia. The lighter the plane is – the easier it is to correct it’s flight path. As you can see – all this points sum up to a Cessna 172. If you want to buy a payware – I suggest the A2A’s 172. I will base my “Learn To Fly” series on this plane – but you can follow my lessons in a default C172 or in a similar plane. Before you start flying – know your plane! Understand the cockpit. Learn what each instrument shows. Print the checklist and limitations (especially – speeds). Do not fly a complicated routes at the beginning. Limit your flights to traffic patterns over selected airfield. Perform several touch-and-go and stop-and-go landings. 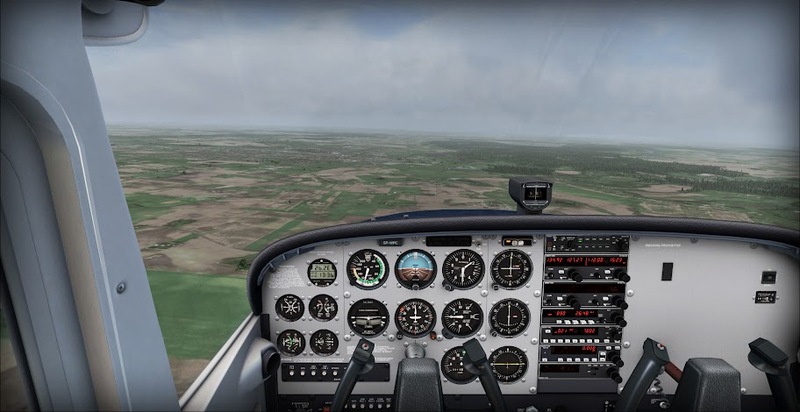 Use your time to do as many maneuvers as possible – flying straight and level for a long time will teach you nothing at this point. When you know how to fly a traffic pattern – go for a short flight in vicinity of your airport and learn to use your compass. I will describe some routes you can take later (in next parts of this series). Autopilot is there to help you – not to replace you. If you want to understand how it works – learn to fly first and use it later. Otherwise – you will end up asking stupid questions on the forums and FB. (default cessna has no AP). I suggest you forget about the AP for the first 20-30 hours. Learn to properly trim your aircraft instead! When you fill comfortable with Cessna 172 – you should explore faster and more complex planes. Default Mooney Bravo is a good choice. Or Piper Comanche (A2A – payware). Why the 747 is a bad choice? Remember that you are the pilot! All the devices on the plane are there to help you, but you are (or at least you should be) the one who controls them. Do not let them take over and never use automated flight systems to do something that you are not capable to do. That is of course – if you want to learn to fly. Learn To Fly (#1) - Which plane to choose? Flight Simulator gives you a wide choice of aircraft. Which should you choose at the beginning? And why it's not a good idea to start with a 747.